The ongoing "Project Titan" is home to Apple's vehicle-related research, with the main focus being in the development and testing of a self-driving car. Apple has already produced a variety of sensor test beds for its fleet of test vehicles, but it appears to already be working on the next test bed generation. According to sources of Reuters, Apple has been in talks with at least four potential suppliers of LiDAR sensors, which could be incorporated into Apple's trials. 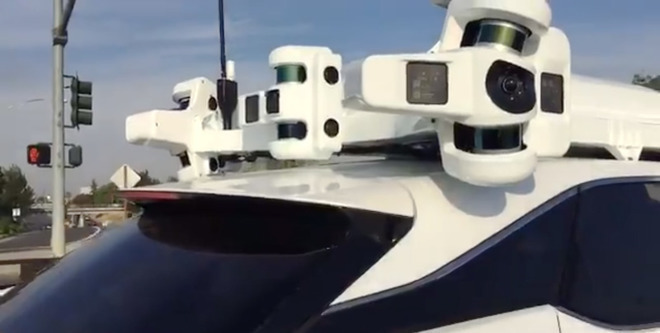 Apple is thought to be evaluating the technology offered by each of the unidentified companies, while simultaneously working on developing its own LiDAR hardware. The updated components at the center of the discussions are smaller and cheaper than the currently used versions, making them easier to mass produce, and to potentially hide within a vehicle to make the system as a whole less obvious to outside observers. Apple is said to demand a "revolutionary design" for the components, ones that depart greatly from existing designs. Existing systems are expensive, costing an estimated $100,000 per car, and the bulkiness and use of mechanical components to sweep the lasers introduces issues with reliability. A non-mechanical alternative would in theory be more robust, while a smaller and cheaper component would likely help foster the use of self-driving system development. Despite the search for self-driving components, and a renewed interest in the field, it is not entirely clear what Apple's ultimate intention for "Project Titan" actually is, as it could be just for computer-aided navigation and control, or it could result in the production of an Apple-designed car. While the focus on self-driving technology lends itself to the possibility Apple is forming a system that it could offer other car producers to use in their vehicles, there have been occasional indications the design of a full car is on the cards. There is a plethora of patents and patent applications relating to car design, including power transfer systems, safety, and even ways for sunroof systems to function. Apple laid off 190 people from Project Titan in February as part of a wide management shakeup, following after another 200 who were dismissed in January, but there are still people being brought aboard. In March, Apple hired a former Tesla engineer with a background in powertrain development, raising the possibility Apple's car could be some form of electric vehicle.